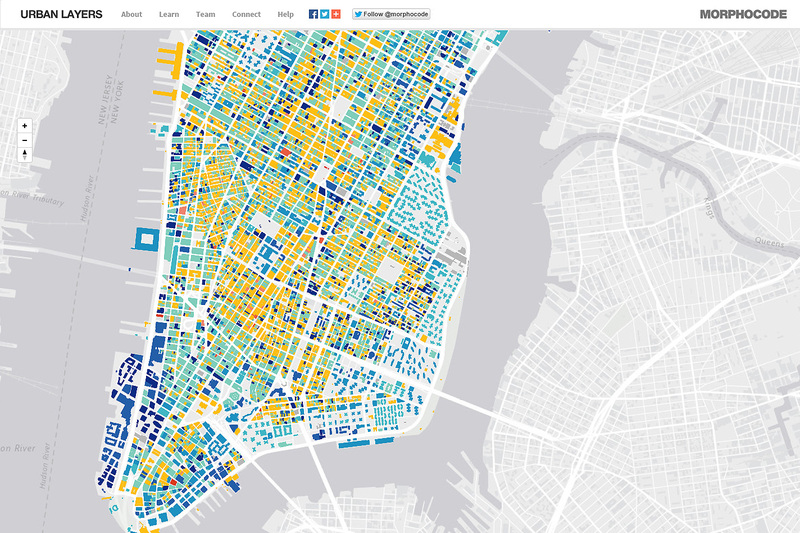 Explore the structure of Manhattan’s urban fabric. We’ve used Mapbox GL, d3.js and data from PLUTO to provide interaction with more than 45 000 buildings. It appears that your browser is not supported! We currently support Chrome and Firefox. "...each block is covered with several layers of phantom architecture in the form of past occupancies, aborted projects and popular fantasies that provide alternative images to the New York that exists." Rem Koolhaas, "Delirious New York"
Urban Layers is an interactive map created by Morphocode that explores the structure of Manhattan's urban fabric. The map lets you navigate through historical fragments of the borough that have been preserved and are currently embedded in its densely built environment. The rigid archipelago of building blocks has been mapped as a succession of structural episodes starting from 1765. The 1811 New York City Commissioners’ Plan for Manhattan fixed an orthogonal matrix of 2,028 blocks — The Manhattan Grid. The Plan provided room for a sevenfold expansion of Manhattan's built-up area at the time and that expansion did occur between 1810 and 1900. By the end of the 19th century most of Manhattan was already built up, while its population grew almost twentyfold. What remains of that period in terms of built environment is one of the principal sources of the island’s sense of human scale. 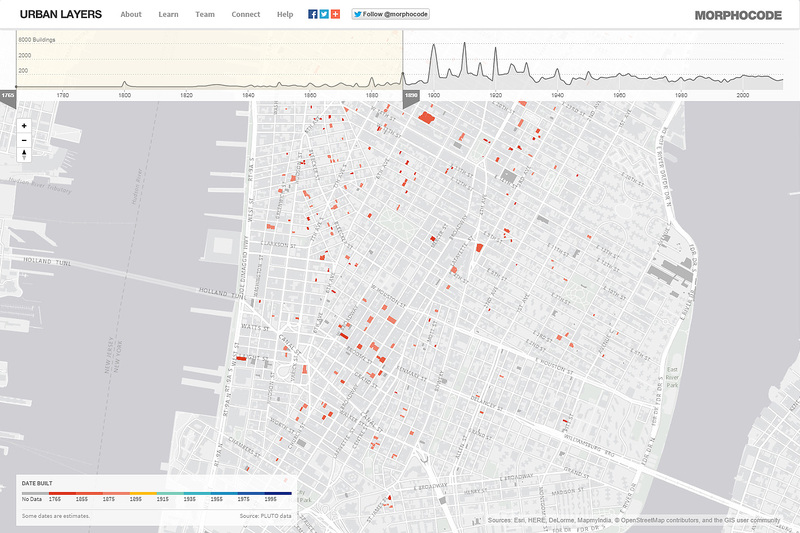 Use the sliders to identify some of Manhattan's oldest buildings; to discover how the beginning of the 20th century marked the island's urban environment or to explore the distribution of building activity over the last decades. Learn more. 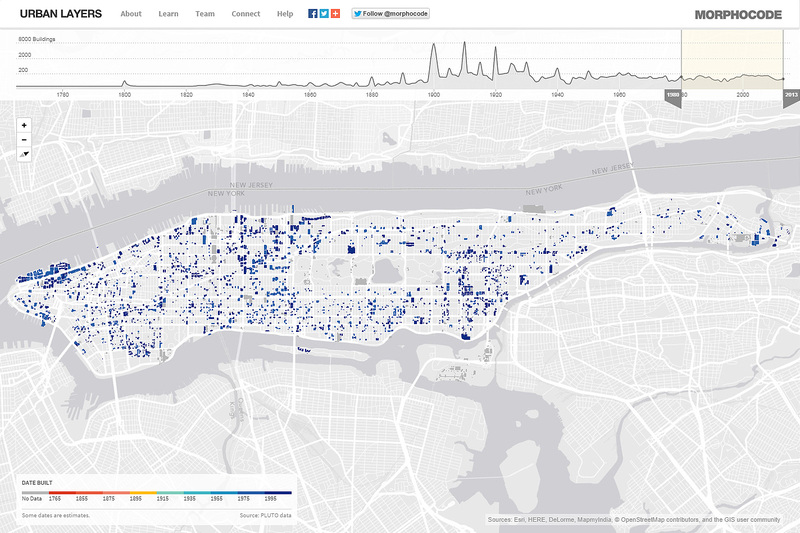 Urban Layers is based on two data sets: PLUTO and the NYC building footprints. PLUTO contains various information about each building located in NYC: year built, height, borough, etc. It was released to the public in 2013 and is considered a huge win for the open data community. Learn more. Please, note that some dates are estimates. There are also dates that seem to be wrong. Urban Layers uses Mapbox GL JS — a new technology based on WebGL that uses vector data both for storage and rendering. It's vector all the way down. This provides greater flexibility than standard solutions — the buildings are filtered and styled on the fly in the browser. The downside is that Urban Layers currently works only in Chrome and Firefox. IE11+ support is coming. Learn more. We are interested in how urban visualizations can raise awareness about important urban conditions and provide valuable insight into how cities perform and how people interact with the urban environment. Visit Morphocode. 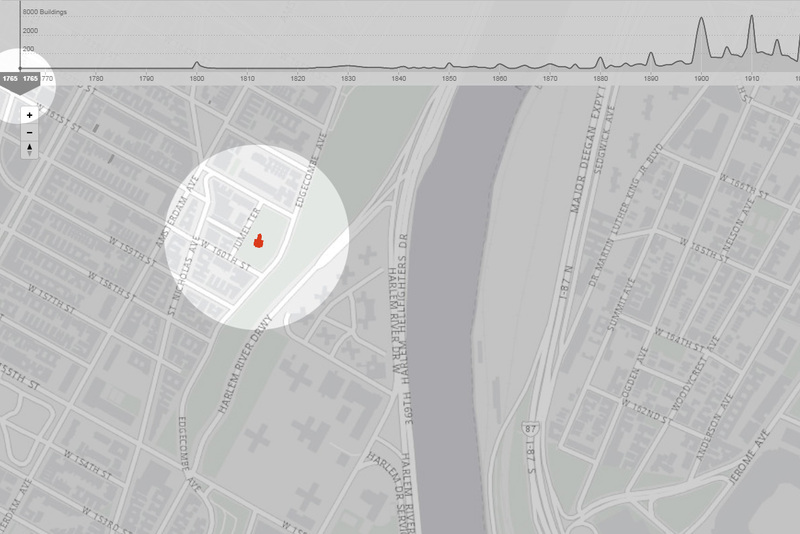 Screen capture of Urban Layers, showing interaction with the map. Screenshot of Urban Layers, showing buildings in Manhattan built after 1980. 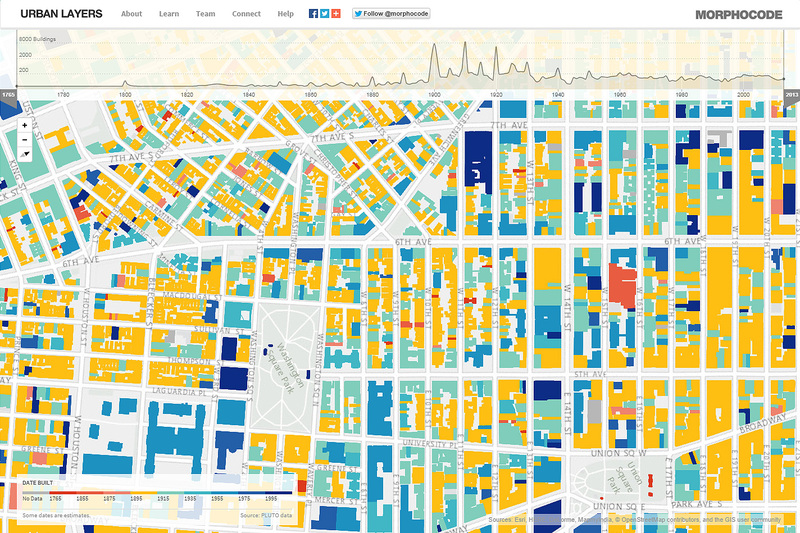 Screenshot of Urban Layers, showing the oldest buildings in Lower Manhattan. 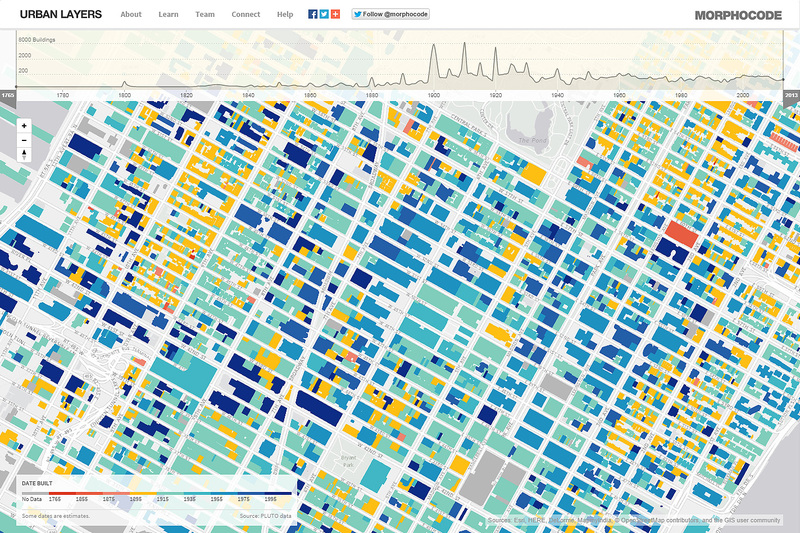 Screenshot of Urban Layers, showing buildings in Lower Manhattan colored by age. Screenshot of Urban Layers: closer look at Midtown Manhattan. Screenshot of Urban Layers, showing fragment of Manhattan's urban fabric. Morris–Jumel Mansion — the oldest buildings in Manhattan according to PLUTO. Graph: d3.js by Mike Bostock was used to build the graph. Map: Mapbox GL JS by Mapbox was used to draw the urban layers. "New York is not a finished or completed city. It gushes up. On my next trip it will be different. Those of us who have visited it are asked this question: "When you were there in 1939, or in 1928, or in 1926, or in 1920, was such and such already there? Oh, really, you don't know then what an effect that makesl" Such is the rhythm of the city." Le Corbusier, "When the Cathedrals were white"
Urban Planners, Civil Hackers, Map Makers -That’s for you!